Editor’s note: Janet Bell opened her Menlo Park-based landscape design, construction and maintenance business, now called Garden Sense, in 1996. We met her not over a garden fence but rather in Lisa Burnett’s Pilates studio. When she started talking about her soon-to-bloom “pom poms,” we enlisted the help of photographer Frances Freyberg, and through an email exchange, learned more about Janet and her career. InMenlo: What prompted your interest in horticulture/landscaping? Janet: I “fell” into this business when I was between jobs in the publishing field and a friend who was/is a landscape designer and contractor needed to hire a person to manage his landscape construction. He told me that since I’d been managing people/projects, etc., that I could learn this. I loved it and didn’t look back. This was in 1985ish. I got my contractor’s license in 1988 and then started taking classes in plant identification and design. This was in the LA area. I moved up here in 1991. I worked for a construction company managing their landscape construction for three years. I started my business here — out of my home — in 1996. There’s always something to learn! And now with the challenge of the drought, more to learn. InMenlo: Do you have a particular style? Janet: I would say that style is driven by a number of factors, at this time, the first being our shortage of water. Since I am in a service business, my projects are client-driven, which means addressing their lifestyle, their needs for their outdoor spaces (barbecue, play space, quiet space, views out of the house, etc. ), the architecture of the house, the feeling of the neighborhood, their budget, etc. This includes how they plan to address maintenance. I always want to bring a perspective that they hadn’t considered, and show them elements that they may not have thought of. I incorporate my “style” into each garden; however, each is unique. InMenlo: What about “pom poms” got your attention? 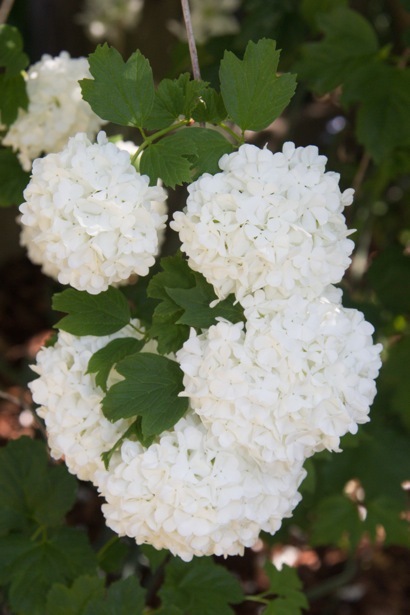 Janet: The “pom poms” are Viburnum opulus ‘Roseum’ with the common name Snowball tree (or shrub). I love their drama. When they are in full bloom, they make me smile — they make the garden fun. I have five of them in my garden; they are between 7- and 9-feet tall and 4 to 5 feetwide. Since most gardeners don’t know what they are, they prune them so they are misshapen 4-foot woody shrubs and don’t bloom. After losing their flowers, they have nice green leaves and then autumn color. My garden looks completely different each season! Nice to hear about Janet Bell’s start in the garden business and long-time success – she’s very well known for her landscapes in this area! One quibble: wouldn’t the name be “pom poms”? 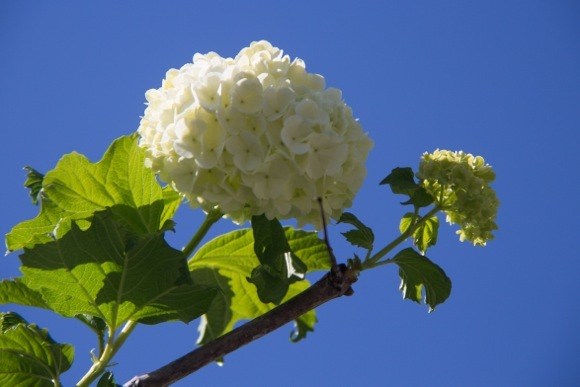 It’s affected to write it as “pomp oms.” They have big round puffy white flowers: pom poms!